I wish I could say that cancer has never touched my life, but I can’t. Actually, it touched my life before I was even born. My father’s younger brother died of cancer, when he was still in his teens. I never met him, but I was named after him. I’m proud of my name and I wish I’d known my uncle. I am the oldest child in my family. I have sisters and I had one dearly loved brother. At 30 years of age, he died of cancer. He had a beautiful wife, a toddling young son and a baby girl that didn’t make her grand appearance until several months after he was gone. He worked hard for the M.D. after his name and barely had a chance to use it. We adored him and our hearts ache for what might have been. 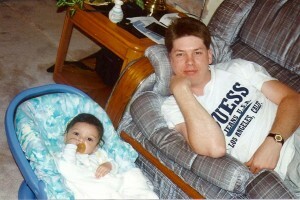 My brother, before he was diagnosed with cancer, and his son. 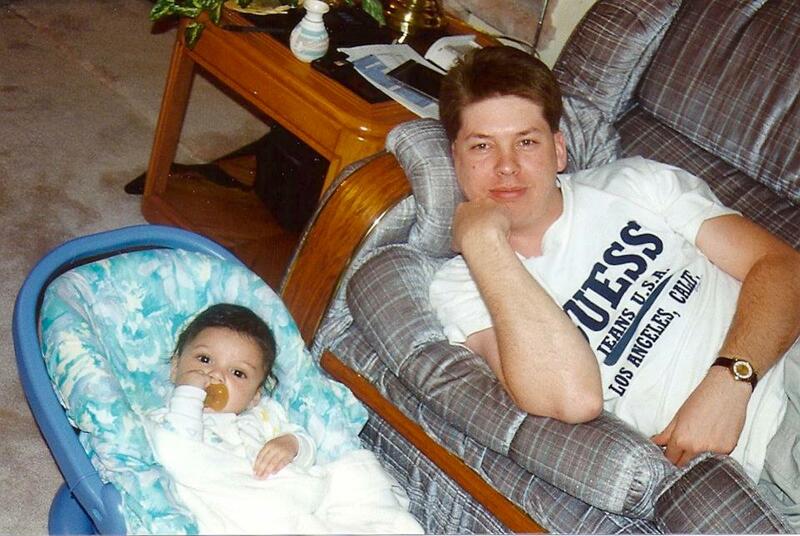 The daughter he never met and his growing boy, nearly a year after his death. 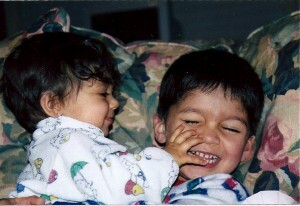 They’re both teenagers now. To me, my husband’s sister, my sister-in-law was most recognizable in her roles as wife, mother and art teacher. I saw her as bright, capable, loving and healthy. Out of all of us, she always made a conscious effort to take care of her body. She died of cancer. The mother in me has wept every time her sons accomplished a goal or achieved a milestone, because she wasn’t here to celebrate with them. She’s missed graduations, marriages and the births of her grandsons. I don’t know what they miss most about her, but I miss her laughter and her smile. My Ma, Gramma to my children and Mom to my husband, died of cancer 9 years ago. It’s true what they say, that children won’t remember the dirty dishes in the sink, the piles of laundry waiting to be folded or the clutter. Everything good about her life has been magnified with time. The way the house looked sometimes, as I was growing up, is truly insignificant. The memories that last are memories of homemade finger-paints, pulling weeds together in the garden, and learning how to sew a straight stitch. I hold close the memories of making paper dolls and Play-Doh creations, reading out loud, singing hymns and swingin’ to the “Oldies.” When my daughter wants to play with my hair and “make it beautiful,” I have a flash of memory, brushing my mother’s long hair and “making it pretty” -with barrettes and bows and bobbie pins, oh my! I clearly recall the miles apart and hours on the phone together, laughter and tears; stern scoldings and warm embraces. My memories say she was the most generous, had the biggest heart, and loved the deepest of any woman I’ve known. My memories shout that taking the time to make memories with my own children is one of the greatest secret treasures my Ma ever shared with me! Not a day goes by that I don’t think of her, remember; and love her all the more. There are many types of cancer. There are days, weeks and entire months designated to the increased awareness of the disease. It is an education I wish none of us ever needed, but one that we must embrace for lives to be saved. Please, click the graphics for a complete list of Cancer Awareness Months and ways that you can help. The American Cancer Society is devoted to raising awareness and funds to find a cure. They offer information on prevention, early detection, research, support, and treatment. I am so thankful for the survivors in my life. Their faith, vulnerability and strength; courage and determination inspire me. My beautiful, young niece is one of them. She continues to write about her journey through breast cancer and life, offering encouragement and education; and building awareness at Pretty Pink Packages online. She is an incredible woman and has given much of herself to others. In our home it wouldn’t be difficult to find a writer or composer, a photographer or three, or a designer, an engineer, an architect or a young inventor. I could show you stories and poetry, music and lyrics, photographs, sketches, drawings and paintings, structures and gadgets built out of Legos, or Lincoln Logs, tin cans and wooden pallets. Presently, there are few copy righted, less recorded and none published. It’s difficult enough for adults to break into their field, but often it is even harder for a teenager to find a respectable outlet for their work. 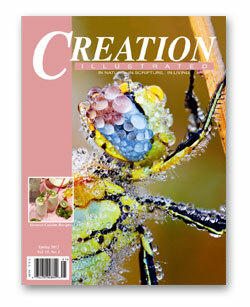 A one year subscription, published quarterly, costs just $26 when delivered to an address in the United States. That’s four issues, 40 color pages, including shipping and handling. My children found it interesting that many of the writers and artists, contributing to the magazine, have been homeschooled. They were also pleased that they did not find this publication full of cookie-cutter stories and articles. Yes, faith and hope are evident throughout, and the publishers state that they “will not accept work that contains profanity, tasteless violence, or inappropriate sexual content,” but you can see the individual author in his writing or art. You’ll find – stories, poetry, articles, reviews, photographs and contests. 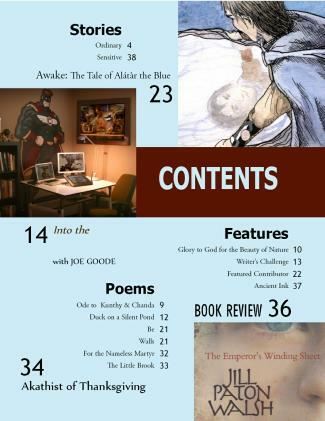 Every issue features: a Writer’s Challenge, the Featured Contributor, a book review, Glory to God for the beauty of nature, Ancient Ink, and an interview. 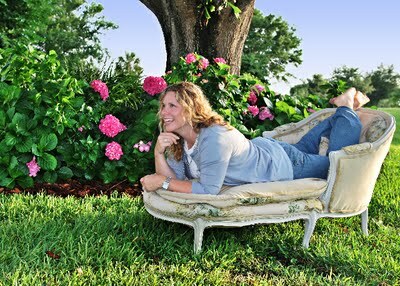 Aletheia Writing Magazine has made their entire Spring 2011 issue available for you to preview, for free. It is full of energy, creativity and a bold freedom of expression. You can also read other reviews of Aletheia on The Old Schoolhouse Homeschool Crew Blog. Although, we hope that a submission will be accepted for publication in Aletheia Writing Magazine, the opinions expressed in this review are my own, and were not coerced in any way. This product was given to me, free of charge, in exchange, for my honest review, as a member of the TOS Homeschool Crew. I receive no other compensation for my reviews on this blog.